Once the summer sun is burning bright, staying indoors begins to feel like a prison—especially when pallid complexions have yearned all year for a healthy bronze glow. For those of us who eschew the concept of year-round tans from bottled bronzer, summertime is a golden opportunity to head outside for a healthy dose of vitamin D. But what can we do post-beach to help sustain a glowing tan? The answer, of course, is moisturize: thoroughly and often. Tanned skin is thirsty skin, and after-sun moisturizers pack more into each bottle to help a tan outlast the day’s sunshine a little bit longer than your average lotion. Sunscreen works to help save your skin before you leave the house; after-sun skin-care products can help heal your skin. These are not just treatments for badly burned skin—something we’ve all experienced on at least one occasion when we forget the sunscreen, only to wind up red all over with skin destined to peel. Those painful cases call for a good basting in aloe vera, whereas after-sun products are for those times when you’ve got a light tan and you simply want to make it last. One of the key ingredients is Angelica archangelica root extract, which helps reduce the inflammation. From a dermatological perspective, Dr. Goldhar explains how anti-inflammatory ingredients work to save the skin. “They cut down the swelling that causes the skin to peel more,” he says. “If you can settle that inflammation, then you won’t get as much exfoliation.” Post-sun products are enriched with these agents—and that’s something you won’t find in an average bottle of moisturizing lotion. 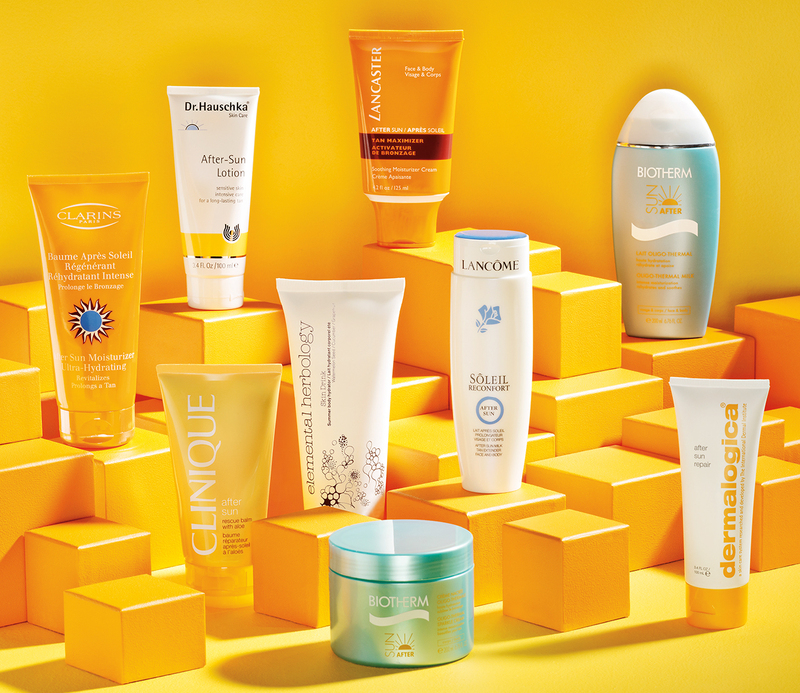 Many post-sun creams augment their ultra-moisturizing formulas with tried-and-tested soothing additives like rich shea butter and almond oil. But a slew of other nurturing and calming natural ingredients are making appearances too, including licorice extract, which is an effective anti-inflammatory agent and moisturizer; aloe and cucumber, which have cooling properties; and watermelon seed, a powerful antioxidant. Dr. Goldhar also recommends looking for specific products with glycolic acids, retinols, and peptides to help restore proteins in the skin—nourishment is key. So go ahead and treat your skin to a cream that will give you a longer-lasting glow and more mileage from time spent on the beach. If only it were that easy to extend the long, lazy days of summer. Pictured, from left: Clarins After Sun Moisturizer, Dr. Hauschka After Sun Lotion, Clinique After Sun Balm, Elemental Herbology Skin Drink Hydrator, Biotherm After Sun Sparkle Cream, Lancaster After Sun Tan Maximizer, Lancôme After Sun Tan Extender, Biotherm After Sun Milk, Dermalogica After Sun Repair.